At Vera Pasta, we pay a lot of attention to the smallest details – something you might not expect for a food as simple as pasta. Here’s why: the quality and the care lavished on every ingredient at every step, turns what might have been an ordinary dish into an extraordinary eating experience. Can’t keep up with in-house pasta making? Don’t have the budget for a pasta chef? Partner with Vera Pasta to fill in these essential gaps and ensure that artisanal quality you’re proud to serve customers/clients. Contact for wholesale prices, delivery days and quantity discounts. Choose from a wide variety of unique and traditional fresh pasta, dry pasta, ravioli and gnocchi. Each item comes in a one-pound package, ready for sale. Our products come fresh or frozen, so you can decide what fits your store’s needs best. Contact for wholesale prices, delivery days and minimums. Interested in expanding your product line with your own company label? We want nothing more than to help make your dream a reality. Vera Pasta carries a variety of shapes and flavors that will undoubtedly make your company stand out. Ready to implement the lucrative and wholesome benefits of artisan dry pasta? Contact to discuss options, strategies and special offers. If you’ve been toying with the idea to join your local farmers market, consider your decision made with our full line of artisan dry pasta. 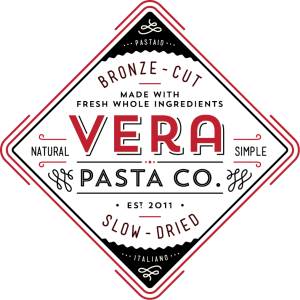 Vera Pasta began in the farmers market, so we’re fully equipped to advise, support and propel you to a successful line of dry pasta products. Contact to learn more and put your best foot forward into the competitive farmers market culture. "Fresh artisan pasta made with attention to quality and consistency. We couldn't make it any better, so we leave it to the experts at Vera pasta." "Convenient, Delicious, & just like Grandma used to make on Sundays!!"